When the city learned last week that the National Geospatial Intelligence Agency had named a swath of the St. Louis Place neighborhood and part of the former Pruitt-Igoe housing project site – a total of 136 acres — as one of four regional options for a new facility, the sunshiners seemed buoyed. In fact, they already had endorsed the proposal through the St. Louis Post-Dispatch, often the mouthpiece for the we-better-take-what-we-can-get attitude. 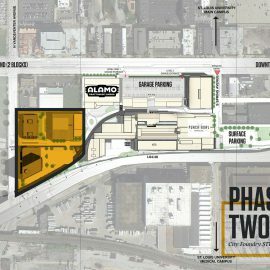 There even was a false teleology that made the project seem like the fulfillment of another big-ticket development that the same camp had embraced as the cure for north city’s woes: NorthSide Regeneration, the project headed by Paul J. McKee, Jr. that has held redevelopment rights to the area since 2009. 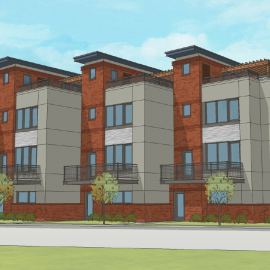 “The Pruitt-Igoe site, in the center of the NorthSide Regeneration project that is the dream of developer Paul McKee, is the only choice,” proclaimed the stentorian voice of the newspaper in a July 18 editorial. At that point, NGA had narrowed sites from 186 to 22 to just six. The NorthSide Regeneration site needed more wind in its public sail, and the paper supplied a good dose. Furthermore, the blighting study promised that after redevelopment was complete (in 2030, natch), the assessed valuation of land in area C would shoot from $13.6 million to $339.5 million, and that in area D from $7.1 million to $257.6 million. These figures don’t allow for 136 acres of the 1500 acre project to suddenly vanish from the city’s property tax rolls, which they would if the federal government purchased them. Federal agencies do not pay municipal property taxes. Of course, redevelopment projects change course as markets ebb and flow. 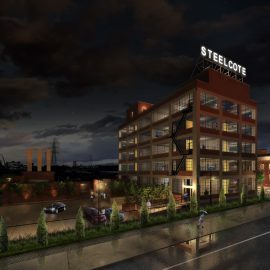 Highly-subsidized projects based on low demand are extremely variable, as the replacement of Daniel Liebeskind towers with a gravel lot at the Bottle District shows. Yet substitution of an entirely different land use and urban form for a project approved through redevelopment ordinance after high public objection is unprecedented. The NGA proposal negates every promise that Paul J. McKee, Jr. ever made to the city, in one move. Yet dour realists also would concede that the area north of Pruitt-Igoe is the least city-like land in the city limits – at least among areas with intact street grids. This meadow-like area is a sort of urban lacuna, attracting a gamut of strange schemes in the past forty years that included everything from a golf course and lake to a warehouse park. Along the way, most houses disappeared, along with their occupants. The deliberate undoing of this part of St. Louis Place extends back to the Model Cities plan for this area, adopted in 1968. 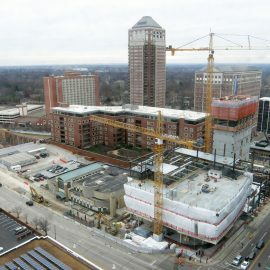 NorthSide Regeneration did not start the depletion. However, instead of opening the discussion of this area’s future to include a superblock option, McKee and his team promised retention of the street grid, no eminent domain on owner occupants in the area – a carte blanche promise also made by Mayor Francis Slay in 2008 – and a restoration of what Jane Jacobs might have called a “web network” in this area. Even urbanists raised eyebrows over the nearly obsequious care shown to this area by NorthSide Regeneration. The switch in plan reflects not simply abandonment of the 2009 promises for this area, but the bending of the entire NorthSide Regeneration package to a possible opportunity. Here is where sunshiners might become dour realists – the question isn’t so much the fate of an urban forest and a set of city blocks nearly devoid of buildings, it’s a question about whether any “regeneration” is happening here at all. Bundling and selling land is not transformative, and after heavy subsidy, provides little multiplier impacts to the local economy. About all the act might do is raise the value of other land owned by the same developer, so that it too can be sold off to the highest bidder. Smart money – and not just a stack of dollar coins in Metro change — is whispering that the Scott Air Force Base site has the highest likelihood to be the new NGA home. That is mere palliative to the dour realists watching NorthSide Regeneration. If NGA doesn’t choose the massive bundle, will McKee just find another single-shot buyer? What will the developer do with other parts of the area? Will the city hold the developer accountable for any of the master plan’s laudable tenets of triple bottom line sustainability and quality urban design? Then there is the flip side, which this dour realist is going to present. 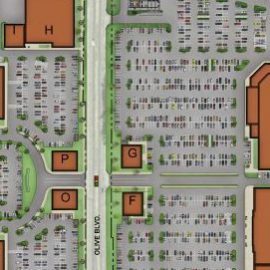 If NGA does buy the north side site, there is little reason to believe that what it will build will be an architectural or urban asset, even should the footprint scale back, or some streets be left in place. Fenced superblocks have rarely been attractive aside from Le Corbusier’s paste-ups of Paris. Anyone who has seen NGA’s current facility, with its bricked-in windows and fortess-like enclosure, understands that the agency’s priorities are what transpires inside and preventing anyone else from ever finding out. Furthermore, when the federal government bestows new architecture upon the urban settings of the City of St. Louis, lately it has missed high marks. The FBI complex on Market Street, entombing the memory site of Tom Turpin’s Rosebud Café, is a mimetic gesture toward the most genially hostile suburban office parks; fenced, devoid of style, soulless. To the east, the sun falls askew upon the yellowed concrete panels of the Eagleton Courthouse, HOK’s design from 1997. While the viewshed from Highway 40 seemed sacrosanct to many who opposed its construction, the bigger failure is a mediocre hulk whose intentions toward bullying the Old Courthouse dome through assiduous mockery are fairly clear. The site plan, with unpurposed open space, supposedly was going to allow for expansion that has not materialized some 20 years later. The most urbane new addition, the two-story Social Security Administration Building at 16th and Delmar, is a capital Blah although respectable in form and relationship to the sidewalk. Certainly, before the postmodern period, the federal government used its vast bonding and granting powers to build downtown landmarks like the Federal Courthouse at Market and Tucker (1934; Mauran, Russell & Crowell), the Abrams Building at Market at 15th (1961; Murphey & Mackey with William B. Ittner, Inc.) and the Main Post Office at Market and 18th (1937; Klipstein & Rathmann), whose murals on Missouri history constitute downtown’s most vivid public storytelling device. In the 19th century, the federal lode provided outstanding civic monumentalism with the Old Post office (1872-1884; Alfred B. Mullet) and even a humanely-scaled munitions depot at the Federal Arsenal (c. 1840). The arsenal, built to serve times rougher than ours and even reaching a peak employment of 500 during the Mexican-American War, shows that a fortified federal compound can enhance the beauty of a city. The security standards of NGA are far more exacting, of course, but essentially they are building the same type of compound, on even more land. As the Army Corps of Engineers prepares environmental impact statements for the four sites, St. Louis might have a shot to reconcile the sunshiners’ abiding faith in letting NGA do what it wants and the dour realists’ fears of a smothering and unsightly federal behemoth. Here is where the city government can lead through advocating for a smaller footprint that protects homeowners and businesses on the site and retains as much of the grid as possible. Mehlville is offering a 101 acre site, the smallest of the four, so trimming the fecund fields should be feasible (if possibly disfavored by the land-selling developer, who already received some subsidy to buy the land). On top of that, the city should urge NGA to pursue a juried design process, with an independent jury that can ensure any possible design is worthy of a visible urban location. Those are the compromises. The lamentation of the realist, however, would continue despite acceptance of compromise. St. Louis faces a greater stake than the calculations of job loss, property taxes and design attributes. The city is staring headlong at whether an entire portion will even be recognizably urban, a prospect that city leaders have faced again and again with jejune pandering to the myths of real estate development. Time after time, removal of viable and resilient city fabric has depleted our wealth and population, while decimating architecture that peer cities have used in place of tourism magnets. As south St. Louis enjoys the web of economic growth that is transmitting across the state streets like a slow and bright fuse burn, north St. Louis could see the same growth. The area around Pruitt-Igoe is devoid of dense and continuous building fabric, but it runs along intact historic streets to areas of greater density. Could those areas see the growth that has stabilized neighborhoods like Shaw and Fox Park? Of course, but only if the city uses its urban planning powers to prevent damaging blunders. If we want to improve the chances of the rest of north St. Louis to develop the same web of economic and social opportunity that the city is incentivizing in south city, we need to dare to dream that the physical fabric of north city can regenerate as urban and accessible to people as it was historically. If this conclusion sounds like sunshiner territory, this writer concedes that he was wrong back in the day. The 2009 NorthSide Regeneration plan, with its promises of careful reinvention of damaged urban fabric, was the right plan after all, at least in letter. As for spirit, well — seems that the optimistic spirit behind that plan has been thrown to the winds of random opportunity.